In previous post, we talked about the basic of Form Controls. I hope you had time to practice it and found useful way of building interactivity to your spreadsheet. You may have heard about the terms “Interactive Chart”, “Dynamic Chart”, or even some other terms that are describing more or less the same thing. Simply put, it’s a chart helping users visualize the data, with some kinds of Input. 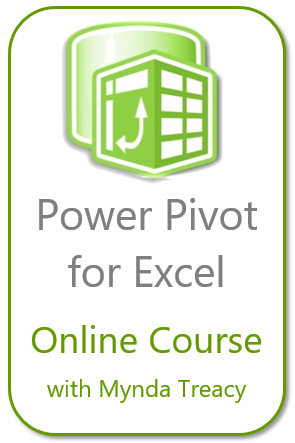 The input can be from direct input to cell(s); form controls, slicer, or it’s simply a pivot chart. Whatever it is, the interactivity is a result of the change in the source data of a chart. A chart is only a reflection of its source data. Although we often use the terms “Interactive/Dynamic Chart”, what’s behind the scene is indeed the effort to make the source data for chart “Interactive/Dynamic”. In coming posts, let’s focus on using different Form Controls to make the chart (data) interactive. You may download a Sample File to follow through. We want to focus on the sales in FY17. Therefore, we are not going to plot FY16 data on the chart. To make it simple, we will not use the original data to plot the chart. 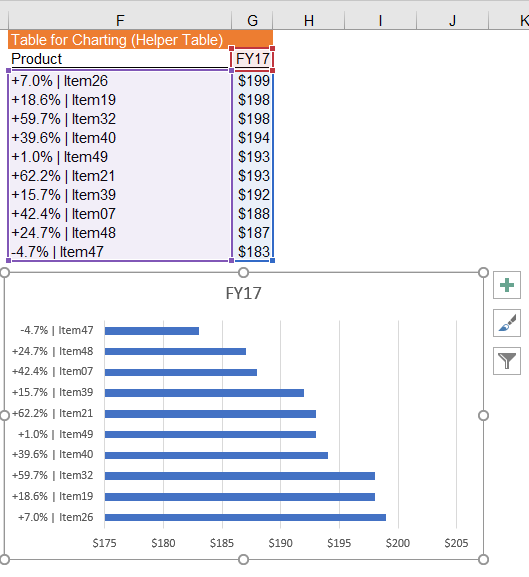 Instead, we will use a “Helper Table” for charting. This is very common to make an interactive chart. The formula in F3 put the “%chg” and the item together, separated by “|” for easy reading. This will become the label of the vertical axis. 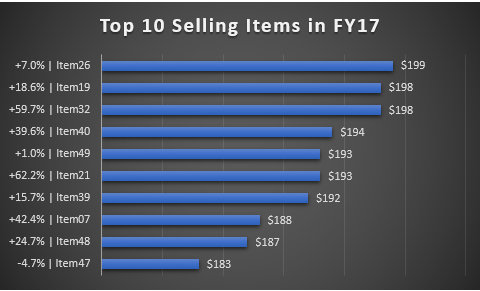 Tip: Sort the original data by values of FY17 in descending order. This simple action would make the setup of helper table muuuuuuuuuuuuch easier. Tip: Did you know that there are many built-in styles for chart? Select the chart, you will “Chart Tools” on the ribbon. Go to Design Tab under “Chart Tools”, there you find many built-in Chart Styles. In this demonstration, Style 7 is used. So how to highlight the bar(s) with negative growth? Note: If you pay close attention, you may have noticed that I had changed the data of “%chg” for Item26 and Item32 from positive to negative. I did it on purpose to enrich the visual of the demonstration. As you see at the end of the above screen-cast, I input a value for item 21 to show you what’s behind-the-scene of highlighting a bar. What we did was to overlay another bar of different color of exact size on top of the existing bar to have an effect of “highlight”. The final part – how to add interactivity to the chart? By adding option buttons and a bit for IF formula. 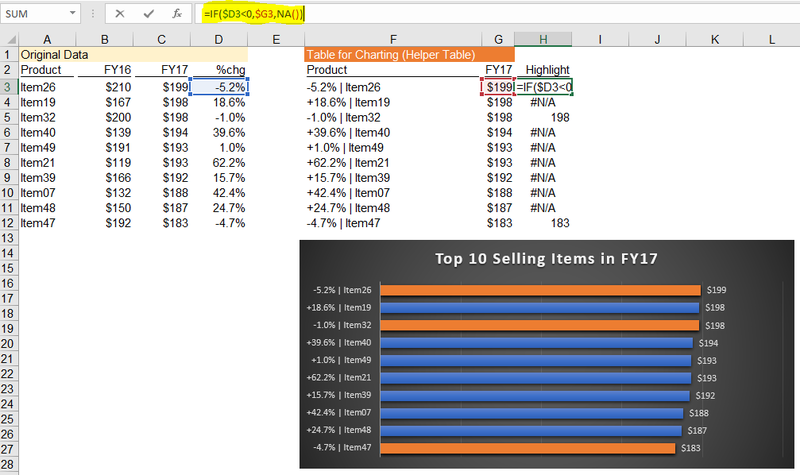 Instead of hard-coding the values in column H, we may use the following IF formula to get the value of “FY17” (remember we need same size), if the %chg is negative. By doing so, we basically highlight all items with negative growth. Not yet what we want until we add a check box and link the formulas to it. You may refer to the basis of Form Controls for how to add a check box and assign linked cell. The formula means: When the checkbox is unchecked, highlight nothing as “FALSE” in H1 yields result of #NA error; “TRUE” yields result of Fy17 IF %chg is negative. Please note, when we interact with the checkbox, we are changing the underlying data of the chart. This is how we make the chart interactive. Not difficult, is it? 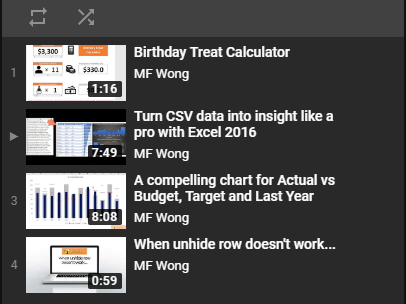 This entry was posted in Chart, Excel Tips and tagged Form Controls, IF, Interactive chart, Option Button. Bookmark the permalink.